On the eve of the Great Depression, Verna Krone, the child of Irish immigrants, must leave the eighth grade and begin working as a maid to help support her family. Her employer takes inappropriate liberties, and as Verna matures, it seems as if each man she meets is worse than the last. Through sheer force of will and a few chance encounters, she manages to teach herself to read and becomes a nurse. But Verna’s new life falls to pieces when she is arrested for assisting a black doctor with "illegal surgeries." As the media firestorm rages, Verna reflects on her life while awaiting trial. 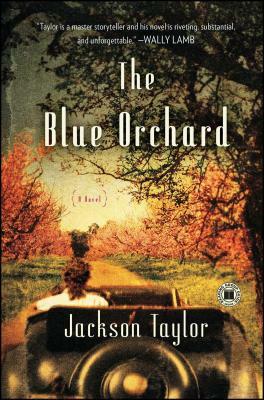 Based on the life of the author’s own grandmother and written after almost three hundred interviews with those involved in the real-life scandal, The Blue Orchard is as elegant and moving as it is exact and convincing. It is a dazzling portrayal of the changes America underwent in the first fifty years of the twentieth century. Readers will be swept into a time period that in many ways mirrors our own. Verna Krone’s story is ultimately a story of the indomitable nature of the human spirit—and a reminder that determination and self-education can defy the deforming pressures that keep women and other disenfranchised groups down. Jackson Taylor is the Associate Director of The New School's Graduate Writing Program, which he helped launch, and where he teaches. For more than fifteen years he has been the Director of The Prison Writing Program at PEN American Center. His short fiction has appeared in Spit, Pink, Moss and Punk, and his poems have appeared in Lit, Sleeping Fish, Witness, and others. For three years he worked at The New York Times in the Culture, Arts and Leisure, and the National desks. He holds a BA from Columbia and an MFA from Sarah Lawrence College. He lives in Manhattan and Greenport. restraint. I was engaged and moved from start to finish by Jackson Taylor’s storytelling art." that drove women and men alike to break a law that could never—and will never—be obeyed.